The best legal export product from Chapare, receives zero support from evo! Late 80’s – early 90’s were the time when the first two trucks filled with banana boxes were exported for the first time, to Arica. One of the major projects of USAID/Bolivia was responsible for this innovation, along with pineapple exports. It is commendable that those Chapare farmers continued with this production, despite the many attempts and threats from the coca growers’ union that resents any type of production, other than coca … which we know where it ends: the cocaine production. 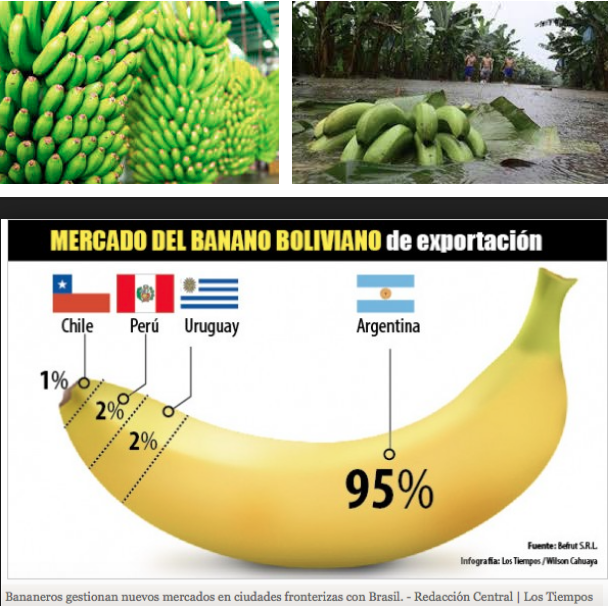 Banana growers from the Tropic of Cochabamba declared a state of emergency because the demand for their product in the Argentine market fell from 200 thousand to 100 thousand boxes in the last weeks. The manager of the Islaban SRL company, Andy Choque, said the sector was concerned because nearly five thousand families of the Tropic are dedicated to the production of bananas for export. Argentina buys 95 percent of the harvest. They export approximately 6.5 million boxes of bananas to that country per year. He said there were at least three reasons for the fall in demand. The first reason is the economic situation in Argentina, where in recent months government authorities have applied measures that affect the population, which is forced to prioritize expenses. Climatic phenomena (floods, persistent rains) do not allow a normal development of the plant. The third cause is related to the constant blockages that occur at the border crossing, where trucks are stranded for several days. Because of this, the product spoils, contracts are broken, and exporters lose customers. The sector is also concerned about the price of bananas. According to Choque, farmers used to be paid four dollars for a 22-kilogram box, i.e. less than 28 bolivianos. Now, it is being marketed at only two dollars, which is less than 14 bolivianos. He also said they were asking the central government for help to find mechanisms so that the thousands of families that depend on this product could secure their income. The president of the banana sector of the Tropic, Agustin Conde, said that the producers have bet on the banana production. “We have made major investments to improve the quality of our fruit. Now, we see that there are problems with our main market, Argentina. We need help,” he said. This entry was posted in Bolivia, Business, Cochabamba, Drug war - narcotraffick, Environment, Politics, Social Unrest and tagged alternative development, cocaine production, corruption in public office, government failures. Bookmark the permalink.